The Sudanese men eat together, while the women eat a short distance away. 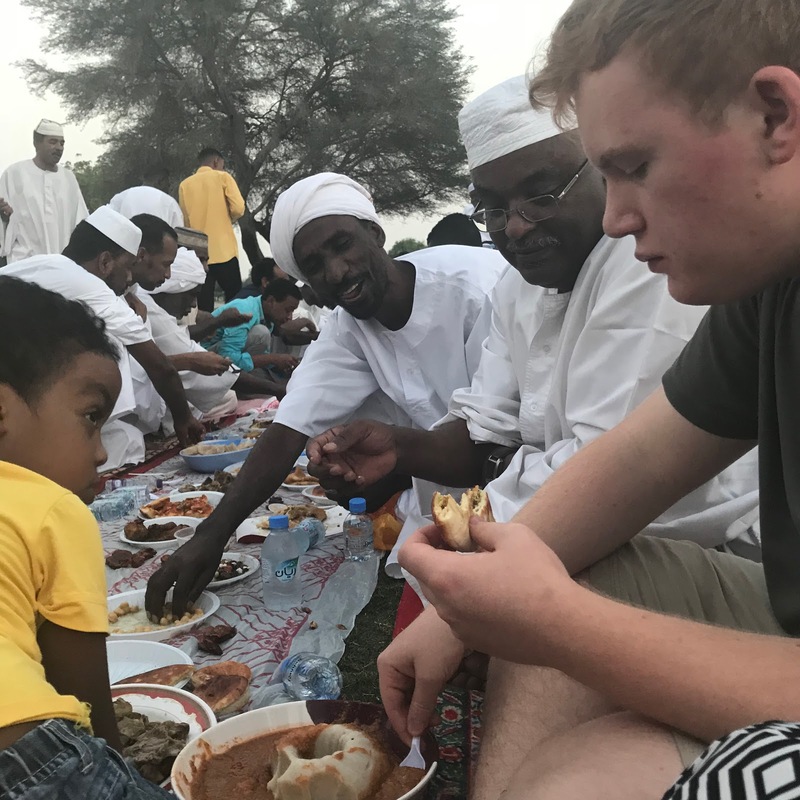 As a non-Muslim living in a Muslim country for almost four years, I must say Ramadan is my favorite time to be in the Middle East. Ramadan, the holy month of fasting and prayer, is observed by Muslims worldwide. It means that from sunrise to sunset, people do not partake of food or drink. 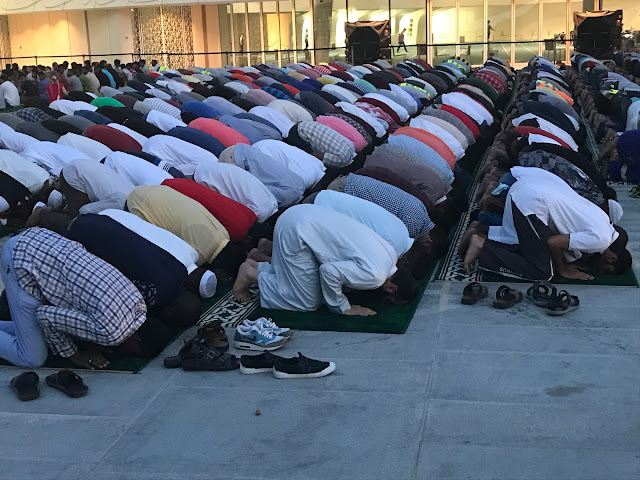 Furthermore, they try to study the Quran and pray more. They apologize to people who they might have offended. Cursing, lying, gossiping is not allowed so that peace can come. There is a desire for more reflection and becoming a better person than before they started the 29-30 day fast (depending on when the crescent moon appears). During the 30 days fast, there are increased prayers (salat) and recitation of the Quran. Any good deeds or charitable giving is considered to give you more blessings during Ramadan. It is sweltering hot in Qatar. I tried to fast, but I could not do it without drinking water. Although I have fasted one day a month all my life in my faith, it is altogether different for one month straight. I did not get up early in the morning before sunrise to have suher (the small breakfast before you start your fast. I would just fast the entire day. And I found myself looking at my watch a lot! 1) I noticed an intentional change in my Muslim friends. They told me that as they fasted and used more self-discipline in their life, they remembered the unfortunate more. Their pangs of hunger or parched throat caused them to understand those around the world who have no food or water. One Egyptian friend told me, "I remember that when I see someone who is poorer or more unfortunate than me, I do not look them up and down. I remember we are the same. There is no difference between me who has more education and opportunities than someone who does not. Any of my suffering to fast helps me to understand others more." 2) The first night of Ramadan is the holiest one of the year. With the small crescent moon to start the fast, every night the moon shows more light. The point of Ramadan is to grow light, as the moon. That is why everywhere there are lanterns, candles, pictures of moons and stars. Everyone wants to gather more light inside of them. I found myself looking at the moon too and watching as it has enlarged--a sign to glean more light. Ramadan is supposed to be a time to sequester oneself from the world, finding more inner light. Decorations in front of people's homes abound everywhere of lanterns and moons. 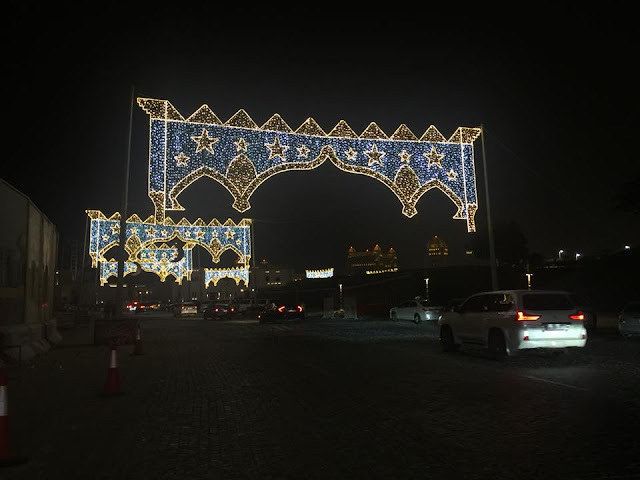 There are about 50 of these huge light panels in the Katara in Qatar. The beautiful light panels that you go through in your car remind me of what it says in the Quran that is believed to happen during Ramadan: all the gates of paradise are swung wide open. 3) Perhaps my most profound emotion as an observer of the Muslim faith is to have a front row seat to remarkable self-restraint. Their examples move me to be to want to be better. Their generosity of spirit that seems to hold no bounds. Their humble and unswerving desire to be more holy inspires me. Imagine the self-restraint needed to water all day long with a long hose and not drink any of the water. 4) Ramadan is not exclusively a solo experience, although it invites more personal prayer and reflection. It is for children too. Although you are not supposed to fast until you reach puberty, children enjoy the sense of newness around them--new clothes, the festive dinners to celebrate the breaking of the fast, and doing charitable deeds for others. 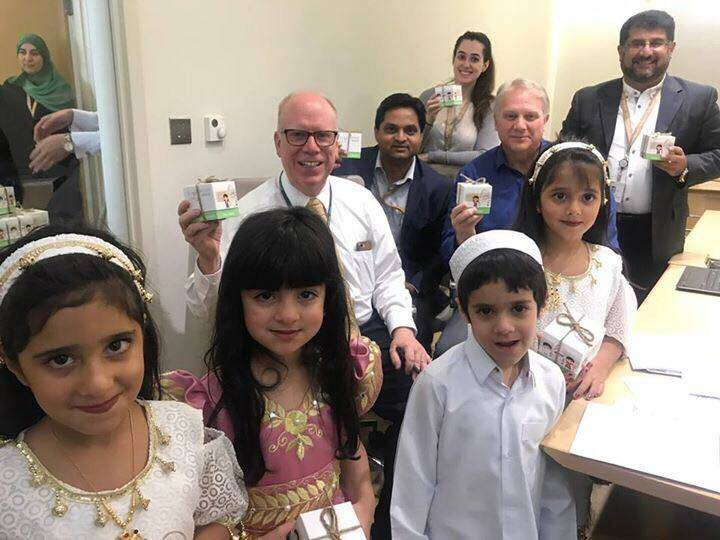 My husband and friends at the hospital where the children handed out treats to the health-care workers. 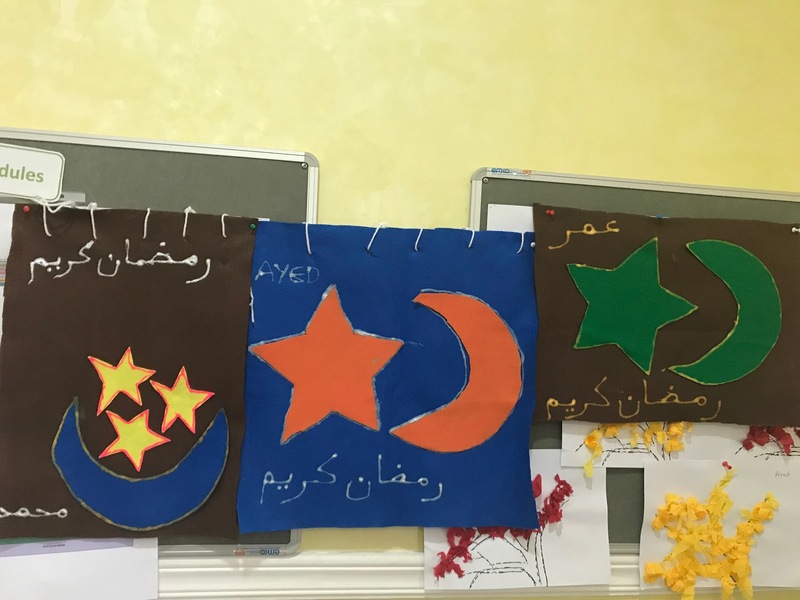 Since I teach art at a school with disabilities, I decided to help them make Ramadan banners. In Arabic, it says, Ramadan Kareem--meaning "May your Ramadan be blessed." 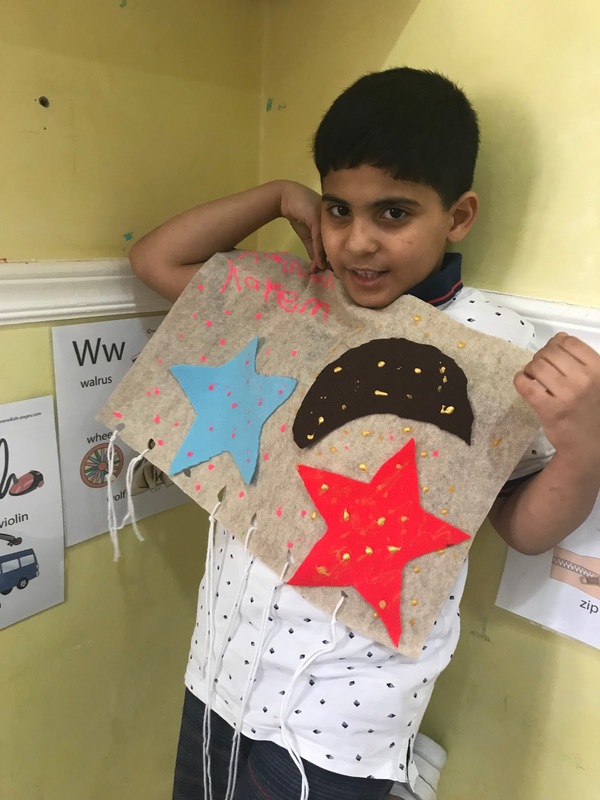 One of the proud students with his Ramadan banner. 5) The next few pictures are at the newly built mosque in Education City in Doha--a magnificent place of great workmanship and peace. 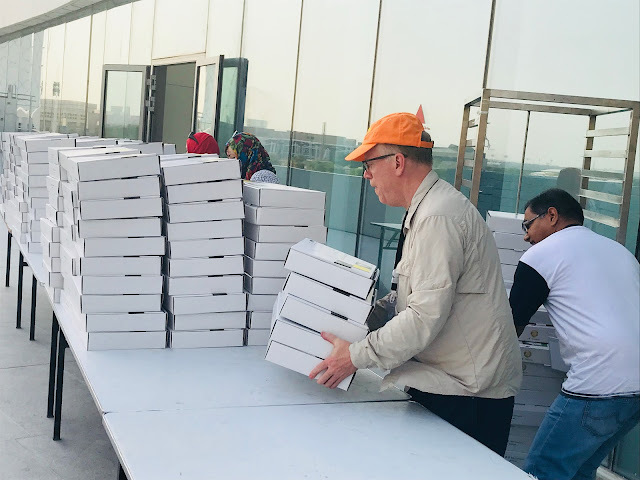 People came from different faiths to feed 1,200 workers for their Iftar meal. 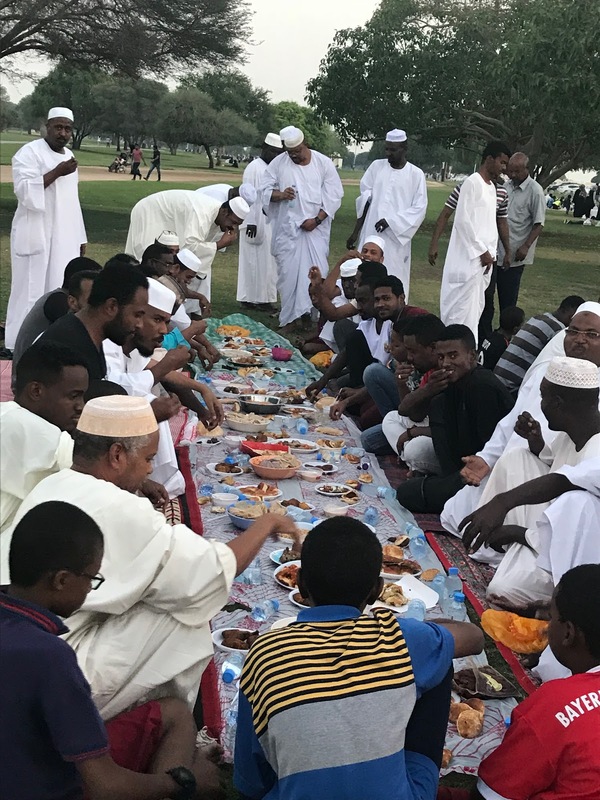 Christians and a few Muslims from all over the world wanted to give their time to those who were fasting. Working together to get 1,200 meals served very quickly. Working together with strangers who became friends... The spirit of generosity and kindness permeated the mosque with people from all over the world. The overarching feeling was that we are all God's children. 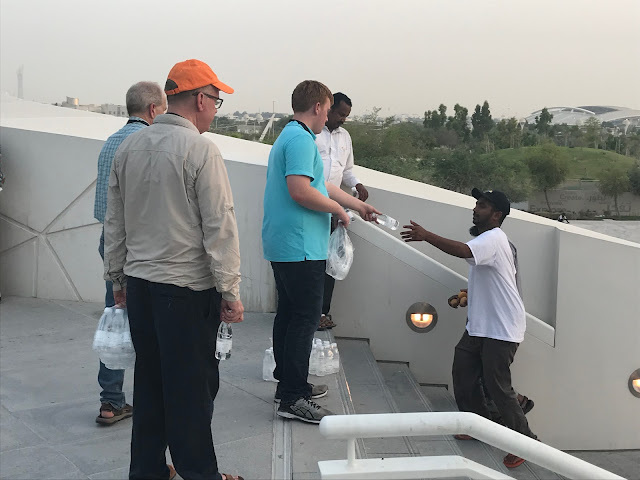 There is something very moving when you give someone water when they have been fasting all day in scorching heat. 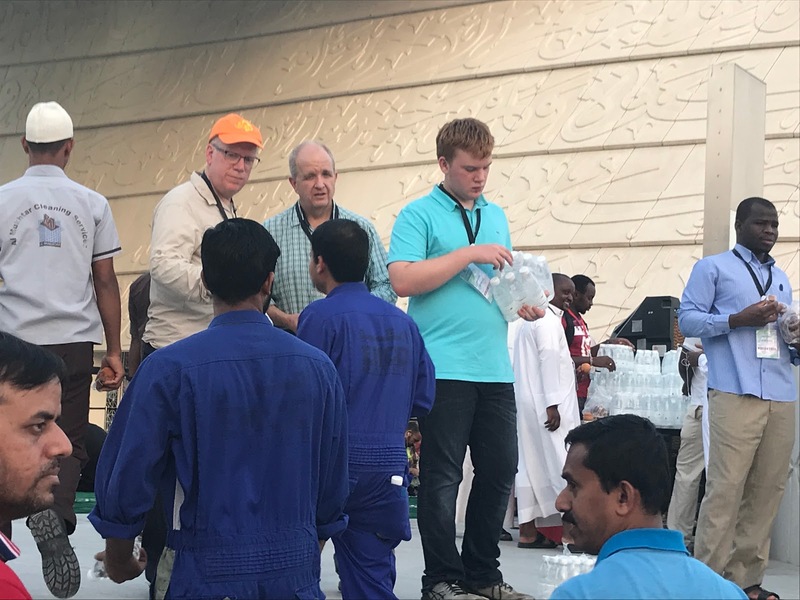 Here are my husband, Elias, and a friend giving free water to the workers in Qatar from Africa and some parts of Asia. Honestly, since it was 11 6 degrees that day, I couldn't help but have a few tears come as I watched the Muslims receive their long-awaited water. It is a scene I will never forget. 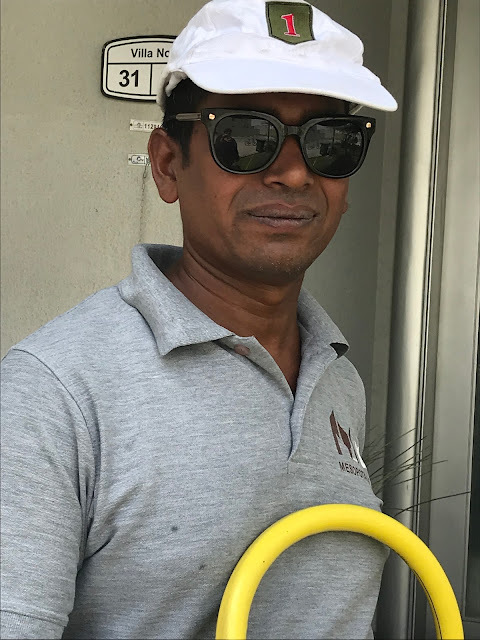 One must always find ways to give water. We who are not Muslims had the most profound respect for our Muslim friends. They are some moments I will not soon forget. 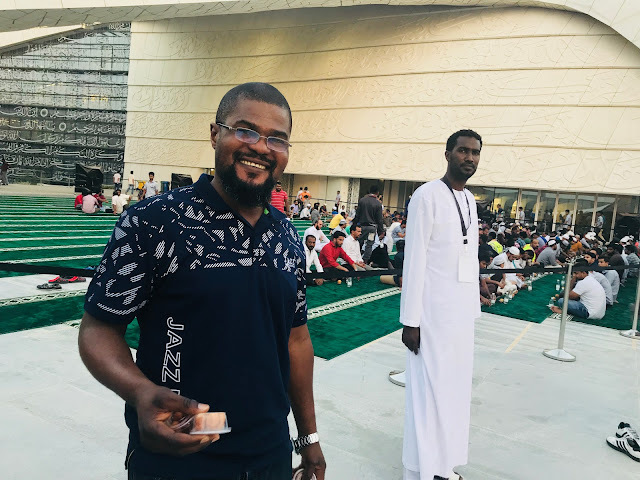 A Nigerian Christian man and a Sudanese Muslim greet the workers who are lining up to receive water and dates before they receive their meal. 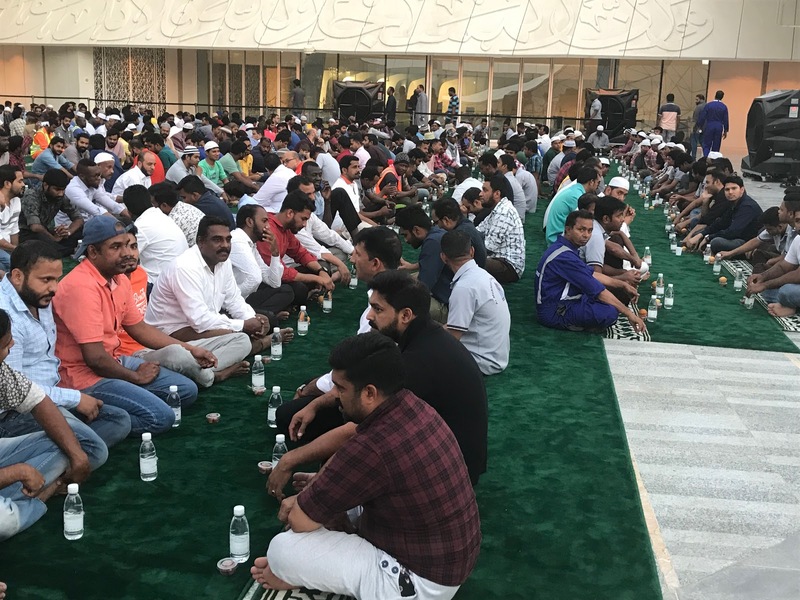 The workers resting before their prayers. Submissive and heartfelt prayers are given before the workers received their meals. A reverence and peace were felt by all--no matter your religion or nationality.